Going into their third league game with a record of 1-1, the boys soccer team was looking forward to taking a win against Mountain View. Little did they know, even with the home field advantage, the pouring rain was coming to ruin their home turf. Regardless of the weather, the Vikings were still ready to go out, win, and advance in their league. However this mindset was quickly tested as the Spartans were able to cause an own goal within fifthteen seconds of the game. The Vikings put up a great fight, slipping and tripping all over the turf. Paly’s Marcus Ama (‘20) took a couple tumbles himself, and says the weather certainly affected his game. “I think I did not play too well today. With the rainy conditions it was hard to keep the ball under control. It was good to have Eric Aboytes (‘19) around me, he played really well and made it easier for the midfielders. I am hoping to bounce back in the next game, and hopefully play a little better,” Ama said. 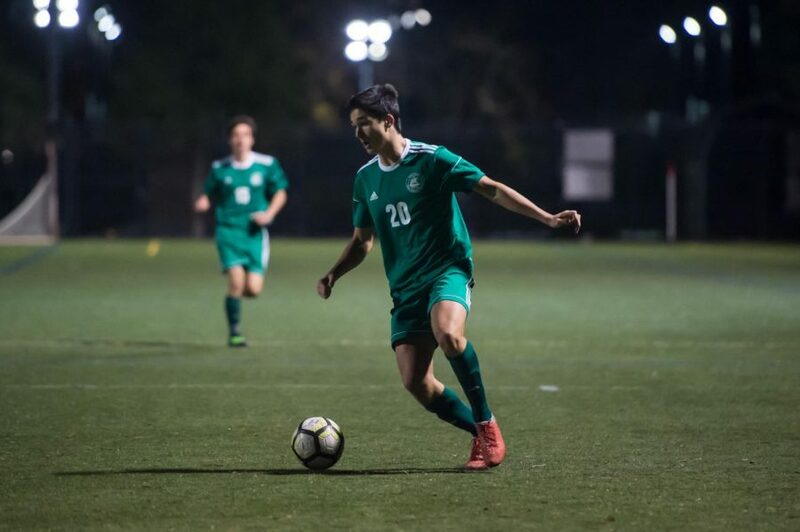 Most players on the team were having some trouble dealing with the wetness, but James Jeon (‘20) used this to his advantage, side tackling from left and right. His ability to get the ball back as midfielder definitely helped keep up the pace of the game and gave the Vikings the hope of scoring more goals. “I know the weather can get in the way of our game, but I’ve learned to use this to my benefit over the years and keep going strong. Plus there is no better time to pull out the slide tackle, in my opinion,” Jeon said. Mountain View was still able to push through the defenses and secured another goal very early on, showing Paly they needed to step it up. Luckily Aboytes and Jason Shorin (’19) rose to the occasion, scoring one goal each for a final score of 2-2 at the half. The next half progressed with both teams having equal possession of the ball, but no one was getting any good shot opportunities. Both sides fought hard for the win, but at the end of the day this was a true neck to neck game, with the teams tying. However, no need to worry Vikings –– these boys have the rest of their season left to redeem this game.